Where there's smoke there's fire. Thanks Gary for bringing up the subject and I think I'll follow your lead and not use any names either. I've seen a several versions of this sign over the years including a heavy gauge painted version. About 15 years ago a paid a vist to a dealer friend of mine that had 6 Golden West signs. He told be that he belived that one was original(which I ended up buying) but that the other 5 were repops. I asked how did he know they were repops, and he replied that he had bought them from the guy that made them. That was good enough for me. I took an good long look at the ones that were repops and have seen the same signs sell as originals on a number of occasions. They were very similar to Gary's except the backs had a smooth glossy finish. The color was dark gray with kind of a white speckeling. From the Pic,the back of Gary's pump plate appears to have a rough finish which I have never seen before. The signs had of number of other slight differences including slightly larger groments and an even white border on the repops. Here is the a pic of one with the baby blue water and mountains from a recent Aumann Auction. Notice, no white border. These always came with a black back. Here is the one ended up buying. It looks very similar to one of Gary's descriptions of a repop. Notice how the white border is wider on the right side than the left. A number of these signs are made like this. If you look close you can even see that the bottom and right gromet holes are off centered. Mark, If you notice mine also has a wider white border on the right side than the left just like yours. Thats an unusual feature to see on more than one sign. Your back looks exactly like mine also. Bill. Wow! What a great thread!! The stories of the Golden West "pump" signs have been floating around for years. My feeling is that nobody knows the true story on what is "real" or fake. There are at least three versions of the sign that I have held and examined. Years ago I bought a rigid Golden West sign with a dark gray back. Not convinced that it was genuine, I sold it to a known collector for what I paid for it. He then later sold it at auction for $900. These "repops" now go for more than $2000!! Gary's analogy of a company that buys a load of pump signs, never uses them and then they're "discovered" later is possible. Who knows? But I question the design of the sign. Take a close look. Would an oil company make a "pump" sign that doesn't reference gasoline or any other product?? Maybe. But it looks more like a "fantasy" sign to me. In the final analysis, since there is no evidence that these signs were ever mounted on pumps and no real "experts", we can only speculate which versions are "real". I agree there are many examples of pump signs with no reference to gasoline or a product. That's why I said "maybe" for Golden West. But then, every example sign you mentioned is KNOWN to have been mounted on a pump. That's not the case with the Golden West signs. All I'm saying is that everything known about the Golden West signs is hearsay. I don't think anyone can produce enough evidence to convince collectors one way or the other. It will probably remain a mystery and subject to controversy in the hobby. But if collectors are willing to step up to the plate and pay two grand for the signs, who cares?? Here's another twist to the story....all porcelain manufacturer's are notorious about having rejects or seconds that that they "throw away". They also do accidental or not so accidental over-runs and if the person who commissioned them doesn't want them, they may "throw them away" or give them to their employees. The reason I am adding the quotes to throw them away is this....about 5-7 years ago before Southwest Porcelain went out of business, we had some limited edition 24" Conoco & Marland triangles made FOR Conoco in Ponca City. We rejected several for the border being mis-aligned. I still to this day, see those rejects pop up on ebay or at a swap meet. They also made an extra 50-100 in anticipation of us buying them also but the deal with Conoco never panned out, so they had to eat those as well. Now, here's where this whole deal can go 'Twilight Zone' on us. What if the whole scenario I just described above took place 70 years ago? Or what if it took place 20 years ago? What if, the original manufacturer of the original plate, had a hard time matching the blues, so they had several rejects that their employees "threw out"? What if they made 100 extra in anticipation of Golden West ordering them, we all know it's easier just to keep making them when you are all tooled up and running rather than re-tool later. The one thing I do know, is that when Southwest went under, they had a BIG auction. They were pulling out signs that you had no idea if they made them yesterday or 50 years ago. 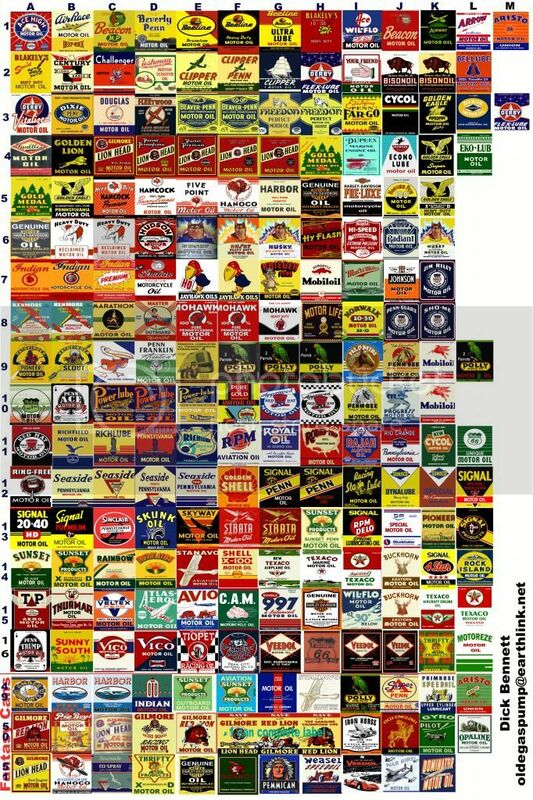 They had made signs for a lot of oil companies and a lot for Coke, I must say it was very confusing because I knew they had also made a lot of stuff in modern times for collectors and dealers. Bottom line is this....even if they original guy who had the first 25 made were to come out and say definitively what he had made and what they looked like, there is no way to know when the other variations were made and by whom. My answer would be this, if you think your's is real, then enjoy it as such because it more than likely is. I know that sounds pie-in-the-sky, but why crush peoples' hope when you don't have anything concrete to go by? A Golden West globe with the same logo as the pump sign exists. It most likely would have gone on a pump and it does not use the word gasoline. A real mystery!!!! In My Opinion The ONLY plates that I would believe to be 'real' would be those with the light blue mountains. There is no plausable reason that any company would accept pump plates with a blue that was so radically different from their globe lens color. Especially when all other examples of their marketing features the light blue. And having actually held an original Golden West globe in my hands, I can tell you that the blue is extremely light - not like the repro pump plates and lenses available in the restoration market. If you look at the examples shown in this posting, you can see the major difference batween the light blue and dark blue examples is the thickness of the white/snow areas in the mountains. IMO that's just sloppy reproduction artwork at play. 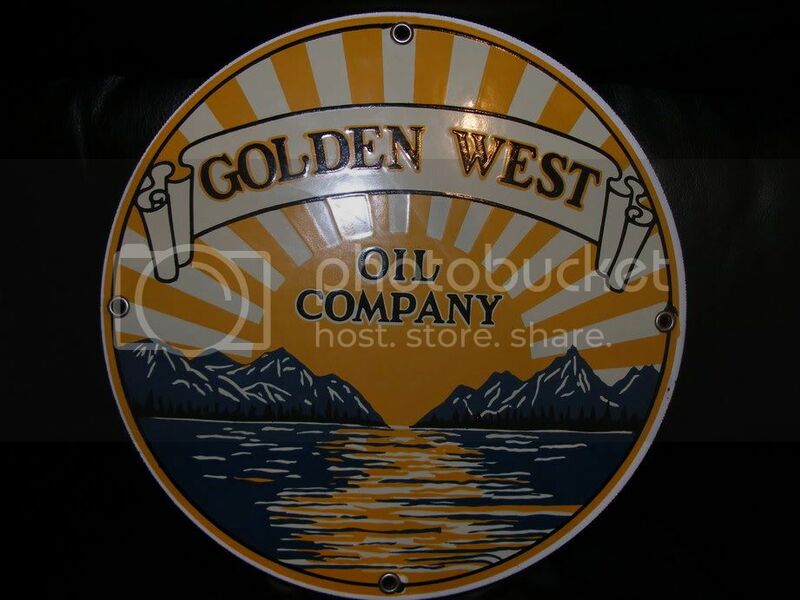 If I was in the market to purchase an ORIGINAL Golden West pump plate, I'd only spend my money on one of the lighter blue examples. Without mentioning any names, if the seller of this sign to me believes it is authenic, please contact me. Now, I do NOT think you are obligated to do this, nor will I get mad. I do NOT hold you repsonsible IF it is a repo. I believe it was sold under good intentions from you. If I do not hear from you, so be it. I consider you a friend and that status WILL continue and I WILL purchase from you in the future again. Thank you and thanks to everyone else. I gave a phone call to a friend of mine whose been around the hobby for a long time and who most in the hobby know. This was his information on the fabled Golden West Pump Plate. Around 1990-1991 a well known dealer by the name of Dave Justice had a "find" of these pump plates. He was selling these at a lot of swap meets in the southeast and midwest. At the same time a dealer out in California also had a find and was selling them on the West Coast. It seems these two were in partnership. When collectors started comparing notes the West Coast dealer seemed plausible due to his location, but Dave Justice finding these plates in a bulk plant in Florida seemed to raise some suspicion but no one doubted him because he seemed like a sincere, friendly young man. Of course a couple years later the entire hobby found out how reputable he really was. Golden West was Mr. Justices first foray into the world of reproduction signage, but few noted it. Only a few astute collectors knew enough to stay away. Our friend says there's less than a handful of originals. Neither one of those supposed finds would seem to be logical as the Golden West Oil Company was out of San Antonio, Texas. AAHHH my theory is that since the company was from San Antonio area the secret stash was found in the basement of the Alamo next to Pee Wee Hermans bike! Great thread till I messed it up. Goldsealoil, Dave actually published a booklet on reproductions in 1993. Just for grins, I thought I would share what he wrote. On the originals, he said blue was either baby blue or cobalt blue and was a silkscreened sign. On the repro's he says some repros were also silkscreenend and that the thinner variants that contained the Dark Navy Blue were questionable. He also mentioned that some of the repros had ground backs. Interesting, I've never seen one with true cobalt blue, has anyone else. As to ones with ground backs, it kinda sounds like a Andy Rooney to me. There's been a lot of great commentary on this thread. I've been hearing about "known originals", stories about bulk plant finds in San Antonio, theories about the repops, "baby blue" colors, colors of the backs, etc, etc. Based upon the signs I have examined, what I've heard over the years from collectors and dealers and now in this thread, there appears to be no definitive conclusion. It seems a majority of collectors believe that the "baby blue" Golden West signs are genuine. But these are also the rarest of the known signs (some say 4 ot 5 known?). Let's logically examine the evidence. As far as I know, there is no evidence that Golden West ever mounted a sign on a pump or truck. There are no station photos or anecdotal evidence. If collectors believe that most of the existing signs are repops and the "baby blue" signs are genuine, then one might assume these signs were likely a company experiment that didn't fly. 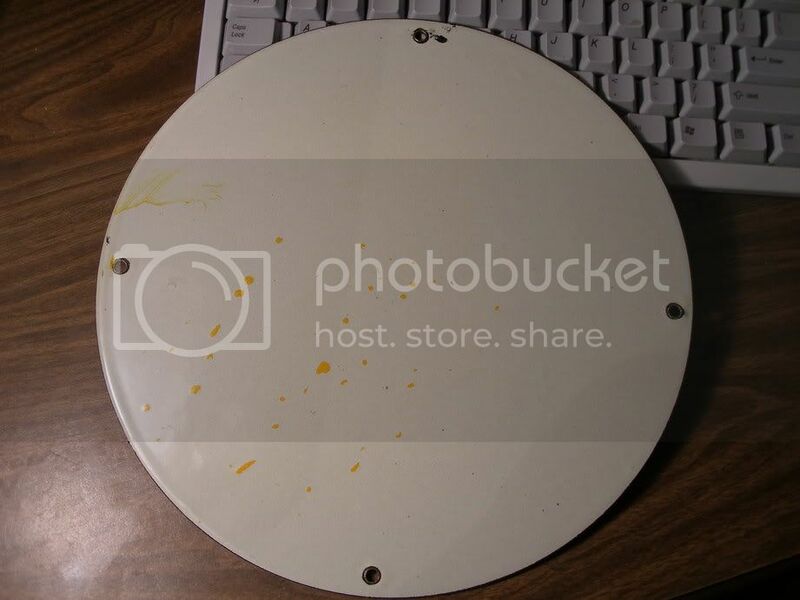 If you believe that the company ordered pump plates, then went out of business, there wouldn't be just 4 or 5. I'm just trying to get collectors to think logically about the possibilities rather than rely on hearsay, much of which is questionable. Myself, I like all of the Golden West signs, repop or not. But I'll never buy another one unless it's dirt cheap!! If there are only 4 or 5 known, then it sounds like they could be samples. Now if that is the case I am wondering if they perhaps did a batch of samples with the darker blue?..say maybe the light blue was not accepted?? Also as far as blank size these were the days before plasma and laser cutters and they were likely punched. This makes me think there is a slight chance of a size close to what they wanted being used (due to inventory at hand) rather than make new blanks for a trial run. Just a few thoughts for what it is worth. If you have chipped one look carefully at the edge it should show evidence of being punched if it is 25 years old or more. If it looks plasma cut, take off running!!.. Just look what showed up on feebay....looks like somebody was reading this thread. Would the REAL Bustermonty please step forward! Am I missing something here? Which one of yall is Bustermonty on ebay? If you want to call 800 862 6912 I'll be glad to stand up. Dumb ole hillbilly here from Tennessee. Still confused. Is st.rod from Colorodo bustermonty on ebay or is bustermonty here also bustermonty on ebay? st.rod is Larry from Colorado. Bustermonty is Bustermonty from ebay and here but not really because Buster and Monty are 2 labs and that leaves this guy Greg Greenburg. I think thats our guy. The one with the sign. Really. Hi, This is the real bustermonty on this sight and ebay or Greg. Not bustermonte that is someone else on ebay. Just trying to keep it straight. Thanks guys it is clear as mud now. LOL. Have a good one and good luck on the plate. Yes, I bought Bustermonty's Golden West sign on eBay. And yes, it has a gray back. And no, I don't care because collectors are still buying the signs regardless of the variety of colors and backs. Still, nobody knows for sure whether all, some or none of the Golden West signs are REAL!! I bring this up again because Aumann Auction's has another Golden West sign in the March 3 Peotone Auction (item #103). Now, Aumann's has sold at least five Golden West signs in the last three years for prices ranging from $990 to $2,750. Only one of these signs was the �baby blue� version. Aumann�s has never qualified any of these signs with a comment like �age unknown�, �possible reproduction�, etc. As experienced auctioneers, it's a normal fiduciary responsibility to warn bidders if there is any doubt about authenticity. Since they haven�t qualified any of these Golden West sign auctions to date, that must mean that no �expert� in the hobby has been able to determine with any conviction which of these signs may be reproductions. Keep in mind, this controversy on the signs has been around a long time. 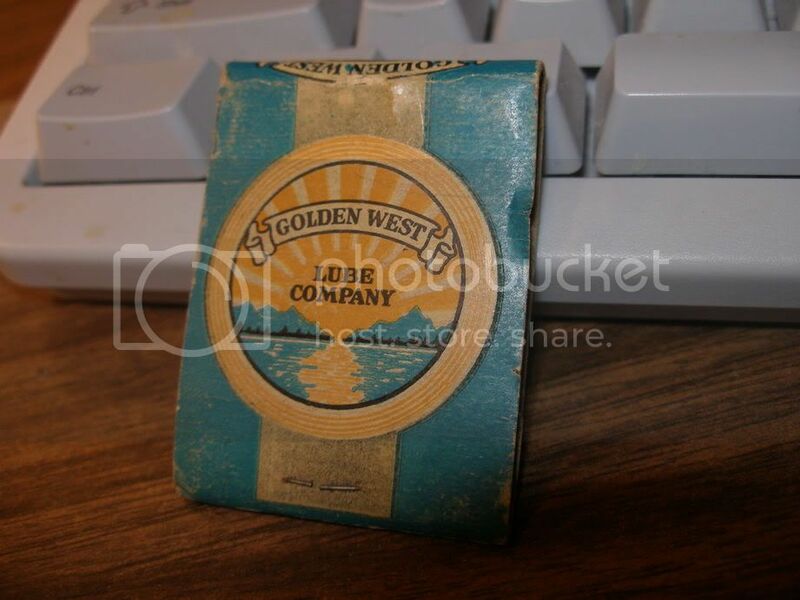 I acquired a Golden West sign when I first started collecting ten years ago and immediately heard all the �expert� opinions about the repops. However, the signs continue to sell for higher and higher prices at auctions. At the same time, experienced and �deep pocket� collectors have been aware of the controversy and the �opinions�. The conclusion must be that collectors just don�t care!! All the signs are well done with great graphics and heavy porcelain. Even if you accept that some of the signs may be repops, someone mentioned maybe 25 � 50 were made? That still makes any of the signs �rare� indeed. 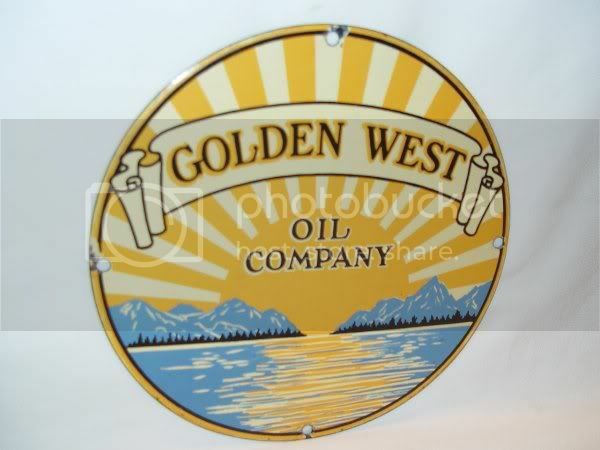 Finally, if any collector out there has a 10 inch Golden West sign they don�t trust and want to unload, I�ll buy it for $500. And that�s a standing offer. Recently found this light blue version. Back is yellow. I ended up getting this one. Fun looking back at this old post. Buster and Monty are long gone but I keep the name in memory now. I just have one question is there an original picture out there as in vintage 1950s gas station with these signs on the pumps ? I would love to see it . I haven't seen one. I think most believe there isn't one.